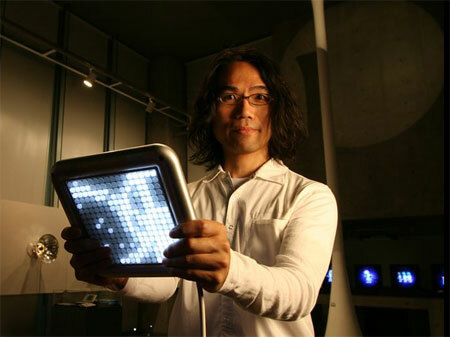 Toshio Iwai, creator of Electroplankton, is working on a new digital musical instrument with Yamaha. It’s called the Tenori-On and, at least from an industrial design point of view, it looks beautiful. And if you’re in Spain, you can check it out live in action. Retrospectively, it seems to be the spiritual cousin to the monome, except of course the monome is purely a control device, whereas the Tenori-On is staking out its territory as a full-fledged instrument in its own right. Of course, there will be a price premium to pay should this device reach market. I’ve been waiting for more news on this device, and I’d been wondering how or if it was progressing at all over the last couple of months. [UPDATED:] More links in comments, plus a post from Pixelsumo with some more detailed specs. The whole thing runs on MIDI — how about that?